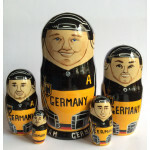 ArtMatryoshka: Matryoshka dolls, Nesting dolls, Russian souveniers, Russian handmade art. 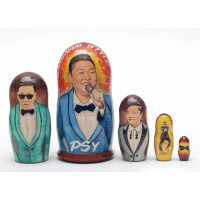 ArtMatryoshka: high quality Russian dolls, Nesting dolls, Stacking dolls, Russian folk art. Worldwide shipping. Let’s see the description and the history of this word… There are a lot of names as plural nouns of a matryoshka doll: matroshka dolls, matryoshka dolls, babushka dolls, nested dolls, Russian nesting dolls and Stacking dolls. And there are a lot of names as singular nouns, of a matryoshka: a matroshka, a matroshka doll, a Russian nesting doll, a nesting doll, a nested doll, a nest doll, a babushka doll, a matreshka, a matrioshka, a matrioshka doll, a Russian wooden doll, a puppet doll, a babooshka, a stacking doll and others. These definitions are the same and the meaning of this word is a set of dolls of decreasing sizes placed one inside the other. 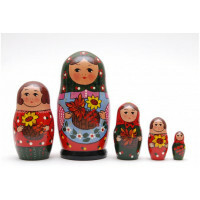 The word matryoshka means the Russian female first name "Matryona" and the word babushka means Russian grandmother. 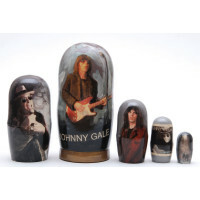 The form of matryoshka doll is usually cylindrical, with a rounded top for the head, tapering toward the bottom, with little or no protruding features; the dolls have no hands (except those that are painted). Traditionally the outer layer is a woman, dressed in a Russian dress which is called sarafan. The figures inside may be either such gender, or other one. The number of nested figures is traditionally at least three or five items, but can be much more, like eleven. The wood that is used for matryoshka production is only lime tree. 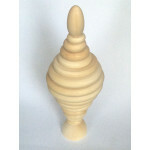 The explanation of this fact is that this material is very flexible and solid. 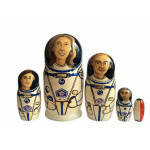 Matryoshka dolls are often presented a particular theme, for instance traditional girls in traditional dresses, but the theme can be different, from fairy-tale characters like Cheburashka to Soviet and Russian leaders like Lenin, Stalin and Putin. 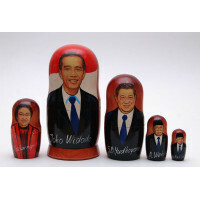 Sets of matryoshka are very popular all over the world. 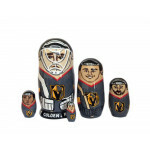 You may buy here different matryoshkas: historical, traditional, sport, cute, funny and chime dolls. 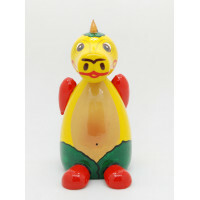 You can also buy a lot of Christmas nesting dolls and wooden dolls. 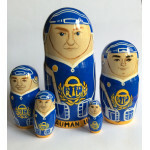 If you don’t that you would like to buy, you may send us the photo and description of such a matryoshka and we should make and send it to you.